Think about the last time you got to enjoy chocolate while out and around Punta Gorda. Perhaps it was a chocolate milkshake at a Port Charlotte restaurant. Maybe it was a Snickers bar you picked up at a North Port 7-11 whose wrapper is still stuffed in a cup holder in your car. It could have been a chocolate chip cookie still warm from the oven. Whatever it was, did you pause to think about where the chocolate came from? Though it seems to come straight from heaven, chocolate is actually produced from cacao, a plant-based food. 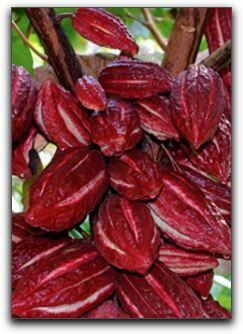 Just like peaches, almonds, and bananas, cacao is a natural substance that comes from a tree. Technically, cacao is a fruit. The theobroma cacao is an equatorial tree whose fruit is shaped somewhat like a football. These color of the pods range from a purplish-brown to a golden shade and can grow to over a foot long. The tree is extremely productive, it shoots out pods year-round and can produce nearly two thousand per year. My favorite thing about the cacao is that its pods not only hang from its branches, they even sprout directly from the trunk! -biological efficiency at its best! Punta Gorda XO healthy chocolate products are made from nature’s most potent source of antioxidants. Cacao seeds have more antioxidants than blueberries, grapes and green tea. The more I learn about XO healthy chocolate, the more I enjoy sharing XO with health-conscience SW Florida folks who want to enjoy chocolate without guilt.